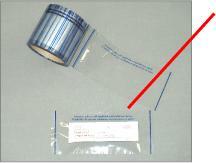 Pocket Tape is used for enclosing paper manuals, small items or items for medical use. It is a standard tape, where the adhesive is inactivated, for example in a square in the middle of the tape. The adhesive can also be inactivated other places, for example by points close to the edge or it can be inactivated between 2 print, so that the customer easily can tear the tape off. Pocket Tape can be made specific for each customer with various pocket size, colors and text. Tapewidth up to 300 mm. Variable length on customers request. Proof sheet, that shows where the adhesive is inactivated. Yellow color = inactivated adhesive. In some cases it can be necessary to make some fix points to hold the item, which is placed in the inactivad square in the middle, in place. They are shown as white circles in the yellow square. For easy handling and packing of papers items etc. The tape can be mounted in the dispenser LP 11 which can be adjusted so it automatically stops on the same position on the tape each time trough the variation in the taperolls tension between where the adhesive is inactivated and where it is still active, this makes the entire process very easy and fast to work with.